Assemble at T2 terminal to meet your group and board your flight for Auckland via Singapore. Fresh breakfast will be served at the airport compliments only of TravelTies. On arrival in Singapore, proceed to board your connecting flight to next destination. KIO ARA!!!! Welcome to New Zealand. (Standard Check in time at Hotel is 14:00 Hrs, However early check in depending on the Hotel Availability). 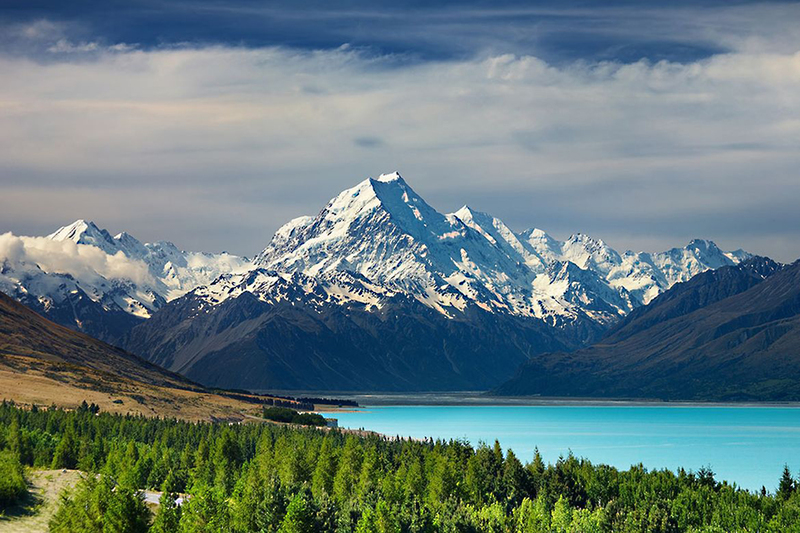 Rest of the day is free to relax and unwind yourself to the fresh air of New Zealand. After breakfast at hotel continue towards Auckland city and its tour by visiting sites like Sky Tower which is the biggest Tower in Southern Hemisphere standing tall at 328 mtrs. Proceed to the observation Deck to get the full city view of Auckland. Continue with city tour of Harbour Bridge, Viaduct Waterfront, Tamaki Drive, Savage Point, Parnell Rose Park, Mt Eden Auckland Domain and Gardens and Enjoy picnic lunch. Post Lunch, proceed to Rotorua via Waitomo Glow-worm Caves. Enjoy the world famous boat ride under thousands of magical glow-worms Grotto. Upon arrival we shall proceed to check into the Hotel Millennium Rotorua / Hotel Lake Distinction / Hotel Holiday Inn or similar. After breakfast at hotel, proceed for a full day sightseeing tour starting with Te Puia where you will see the biggest geysers in Rotorua and also largest active one in Southern Hemisphere. Agrodome Sheep Show where you can see 19 different types of sheep and enjoy this interactive show that will tickle your bone. En Route Enjoy Beautiful Skyline Gondola with 1 luge ride – the largest luge track in Southern Hemisphere. Enjoy picnic lunch. Visit for optional activities to Velocity Valley or OGO Zorb – such as the Bungy Swing, Swoop, Free Fall Extreme and more. After breakfast at hotel, proceed for the 8-10 mins Float Plane Ride by the Lake Rotorua. 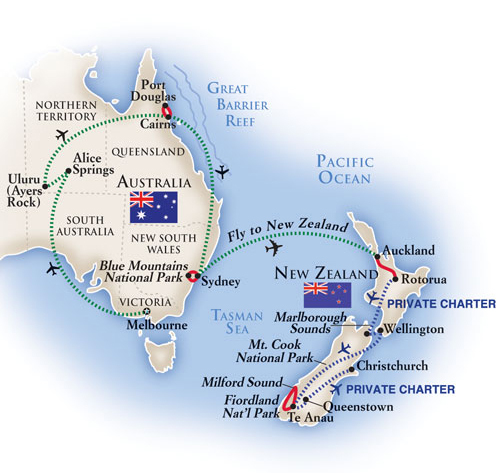 Post that, proceed for a day trip to Taupo – 1 hour drive from Rotorua. On arrival enjoy picnic lunch. Enjoy optional activities such as Sky Diving and Hukka Falls Jet boat ride. Mid-afternoon return to Rotorua and free time for leisure / shopping. After breakfast at hotel continue towards Wellington. En-route enjoy Picnic Lunch cooked by chef. Upon arrival, we shall proceed to check into the Hotel James Cook Grand Chancellor or similar. Rest of the evening is free for leisure. Enjoy Indian dinner and spend overnight at the hotel. After breakfast at hotel, we shall proceed for a City tour which includes View New Zealand’s Parliament Buildings and Beehive, Hop off to visit Old Saint Paul’s Cathedral, Wander the Wellington Botanic Gardens, Ride the historic Wellington Cable Car, Get out and feel the breeze at the top of Mount Victoria loads of photo opportunities in Wellington City and surrounds. Picnic Lunch and Continue with visitfor a guided tour to the Te Papa – National Museum of New Zealand and enjoy some free time for leisure for shopping down the Lambton Quay area. After breakfast at hotel, check out and we shall say goodbye to North Island as we proceed to Wellington Airport to board our flight for Queenstown – South Island of New Zealand. Upon arrival enjoy our 30 mins Jet boat Ride experience and lunch in Indian restaurant. Rest of the day is free to explore beautiful Queenstown on your own by walk. Enjoy Indian dinner and spend overnight at the Hotel Novotel Lakeside / Hotel Millennium or similar. After breakfast at hotel, we shall proceed to City Tour of Arrow Town, Enjoy the Lakes District Museum or Chinese Miners’ Settlement. (Admission at own expenses) AJ Hackett Bungy Bridge: Experience the thrill of bungy either as a watcher or maybe even a jumper. Bungy Jump at own expenses. Post lunch proceed for Lake Wanaka it is New Zealand’s fourth largest lake, and estimated to be more than 300 m deep. Evening return to Queenstown via Mrs Jones Fruit Stall for some Jam and Chocolate Shopping back home. Lakes, then walk across The Chasm. At the deep waters of Milford Sound, board your 1 3/4 hour Scenic Cruise. See the wonders of Mitre Peak, glacier-scarred rock walls and waterfalls. After breakfast at hotel, Enjoy Beautiful Skyline Gondola to have a beautiful view of Queenstown from Bob’s Peak. Rest of the day is free for families to shop and for teenagers to enjoy all other optional activities such para gliding, river rafting, nevis swing, Sky diving etc. Enjoy picnic lunch and the beauty of Queenstown. After breakfast at hotel, we shall check out and proceed for Christchurch. En route also visit Lake Pukaki – view of Mt cook and Lake Tekapo. Enjoy Picnic Lunch. Also Enjoy 20 mins Helicopter Ride with snow landing (weather Permitting) on this day from Glentanner base. Continue towards Christchurch. Later on arrival proceed to Hotel Rendezvous / Novotel Christchurch / Hotel Distinction for check in. After breakfast at hotel, proceed towards Christchurch city tour – the largest city of New Zealand in South island affected by 2011 earthquake. Also know the as the Garden City. Visit The International Antarctic Centre where you get a chance to witness a Storm Room which goes to – 20 Degrees. Enjoy optional 4D show and Hagglund Ride. Enjoy Picnic lunch. Half day free for shopping at the famous Westfield Mall. Enjoy Indian dinner in an Indian Restaurant and spend overnight at the hotel. After breakfast at hotel, proceed for Christchurch International Airport check in for your flight boarding to Mumbai VIA Singapore. !!! TOUR ENDS. RETURN WITH HAPPY AND GOOD MEMORIES OF THE TOUR !!! CERTIFIED KIWI SPECIALIST by the New Zealand Tourism Board. Fly on World Class – Singapore Airlines. Polynesian Spa, 30 Mins Jet Boat Ride, Gondola and 20 mins Helicopter Ride with Snow Landing* all included in the package. The only tour company providing entire free day in Queenstown to shop / enjoy optional activities endless and hassle free. No hectic schedule, only relaxation.